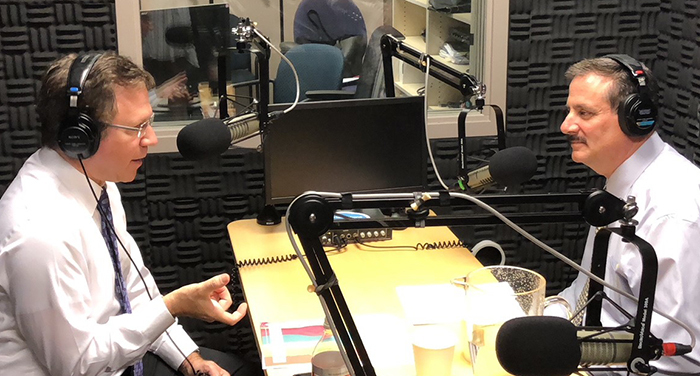 Richard S. Isaacs, MD, FACS, left, chats with Federation COO Chris Grant in the debut episode of the Permanente Medicine Podcast. You’ve just been selected as physician-in-chief for your hospital and your leadership team informs you that within your first week on the job, your facility will serve as the alpha site for the first electronic medical record system in all of Kaiser Permanente. This scenario was the reality for Richard S. Isaacs, MD, FACS, in 2005. 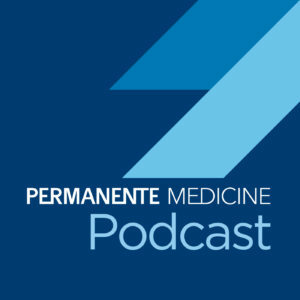 In this premiere episode of the “Permanente Medicine Podcast,” Dr. Isaacs, CEO and executive director of The Permanente Medical Group (TPMG), and president and CEO of the Mid-Atlantic Permanente Medical Group (MAPMG), recounts this experience and explains how it played a significant role in shaping the type of leader he is today. TPMG and MAPMG are two of the eight Permanente Medical Groups exclusively providing care to more than 12.2 million Kaiser Permanente patients and members across the country. This podcast is the first episode of an ongoing series hosted by Chris Grant, executive vice president and chief operating officer of The Permanente Federation LLC. Dr. Isaacs serves as co-CEO of the Federation. The podcast aims to bring some of the brightest minds together to discuss how to address current challenges and prepare for the future of medicine and care delivery. To contribute to the ongoing national dialogue on the future of health care, Grant will be inviting Permanente physicians and other prominent industry leaders to join him on a quarterly basis for these discussions. In addition to reflecting on his whirlwind experience implementing the first instance of Kaiser Permanente’s comprehensive electronic health record, Dr. Isaacs talks with Grant about his upbringing in Detroit, other early experiences that shaped him as a physician leader, his love of music, and his passion for practicing Permanente Medicine. Listen to the podcast below, or download it on iTunes. Connect with Dr. Isaacs on Twitter at @Dr.RichardIsaacs and Chris Grant at @cmgrant. Robert Pearl, MD, gets a first-hand look at hospital care after a recent hospital stay.